Ezekiel "Zeke" Elliott (born July 22, 1995) is an American football running back for the Dallas Cowboys of the National Football League (NFL). He played college football at Ohio State, where he earned All-American honors in 2015, and was drafted by the Cowboys fourth overall in the 2016 NFL Draft. Despite his athletic pedigree, Elliott attended more academically-driven John Burroughs School in Ladue, Missouri, where he was a three-sport star in football, basketball and track, and also played baseball. He played as a running back for the John Burroughs Bombers football team. As a junior in 2012, he was named the St. Louis Post-Dispatch offensive player of the year after rushing for 1,802 yards and 34 touchdowns and receiving 23 passes for 401 yards and six scores. In his senior year, he had 3,061 all-purpose yards and 50 total touchdowns, including 2,155 rushing yards and 40 rushing touchdowns. He led the football team to three straight title games, but lost all three. Also a standout track & field athlete, Elliott was a state qualifier in sprinting and hurdling events. He capped his high school career by winning four state championships at the Missouri Class 3 state championships in 2 1⁄2 hours (100-meter dash, 200, 110 high hurdles and 300 hurdles). He recorded career-best times of 10.95 seconds in the 100-meter dash, 22.05 seconds in the 200-meter dash, 13.77 seconds in the 110m hurdles and 37.52 seconds in the 300m hurdles. He was named the Gatorade Track Athlete of the Year in the state of Missouri. Considered a four-star recruit by Scout.com, Elliott was listed as the No. 9 running back in the nation in 2013. Despite overwhelming support and pressure for Elliott to sign with his parent's alma mater, the University of Missouri, Elliott decided to sign with Ohio State University. As a true freshman at Ohio State University in 2013, Elliott rushed for 262 yards on 30 carries with two touchdowns as a backup to starter Carlos Hyde. In 2014, Elliott took over as the starter. During the season, Elliott was named to the Academic All-Big Ten Conference team. In the final two games of the 2014 season, against Indiana and Michigan he ran for 107 yards and 121 yards respectively. In the 2014 Big Ten Championship Game against the Wisconsin Badgers, Elliott ran for 220 yards on 20 carries for two touchdowns. In the 2015 Sugar Bowl against No. 1 Alabama, Elliott ran for 230 yards on 20 carries in the first-ever college football playoffs as Ohio State defeated Alabama in a hard-fought game, 42–35. He was named the Offensive Player of the Game. He then capped the Buckeyes' championship season by rushing for 246 yards on 36 carries and scoring four touchdowns against the Oregon Ducks. He was named the Offensive MVP of that game as well. In a post-game interview following Ohio State's 14–17 loss to Michigan State, on Nov. 21, 2015, Elliott announced that he would forgo his senior year at Ohio State and enter the 2016 NFL Draft The following week Elliott ran for 214 yards on 30 carries in a 42–13 Ohio State victory over Michigan in Ann Arbor. Elliott finished his career at Ohio State second in career rushing yards behind Archie Griffin and ahead of Eddie George, with 3,961. Ezekiel Elliott received numerous honors during his tenure at Ohio State. In the 2014 season, Elliott was named the Offensive MVP of both the 2015 Sugar Bowl and the 2015 College Football Playoff National Championship Game. His success at the end of the 2014 season made him a front-runner for the 2015 Heisman Trophy. After a successful regular season in which he gained 1,672 yards and 19 touchdowns, Elliott was named the 2015 Graham-George Offensive Player of the Year, 2015 Ameche-Dayne Running Back of the Year and was selected as Unanimous First Team All-Big Ten. In addition to the yearly awards, he was also named Big Ten Player of the Week twice during the 2015 season for his performances in Week 5 against Indiana, and in Week 13 against Michigan. Prior to the draft, Elliott was labeled as the most complete back to enter the NFL since Adrian Peterson in 2007, and was predicted to be a top 10 selection. On a draft breakdown by NFL.com, he drew comparisons to Edgerrin James and was listed as a three-down back that had "rare combination of size, athleticism, pass-catching and blocking skills", and that he "should still come out of the gates as one of the most productive young running backs in the league". Elliott was selected 4th overall by the Dallas Cowboys in the 2016 NFL draft on April 28, 2016. He is widely regarded as an early favorite for the 2016 Offensive Rookie of the Year while playing behind what many agree upon as the NFL's most dominant offensive line leading up to the 2016 NFL season. On May 18, 2016, Elliott signed his four-year rookie contract reportedly worth $24.9 million with a $16.3 million signing bonus. Elliot was named the Dallas Cowboy's starting running back going into the regular season, ahead of veterans Alfred Morris and Darren McFadden. In his professional debut, he had 20 rushing attempts for 51 rushing yards and scored his first career touchdown on an 8-yard run against the New York Giants. The following game against the Washington Redskins, Elliot had 21 carries for 83 yards and a touchdown but also fumbled twice, losing one of them. 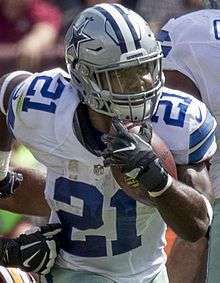 In a Week 3 matchup against the Chicago Bears, he posted his first game with over a hundred yards and finished Dallas' second consecutive victory with 30 rushing attempts for 140 rushing yards. On October 9, 2016, Elliot helped his team defeat the Cincinnati Bengals 28–14 and rushed for 134 yards on 15 attempts and scored two rushing touchdowns, including a 60-yard touchdown. The next week the Cowboys played the Green Bay Packers and Elliot continued his four-game streak with over a hundred yards after carrying the ball 28 times for 157 rushing yards. After the ninth game of the 2016 season, he became the second Cowboys rookie to rush for more than 1,000 yards in a season, after Tony Dorsett achieved the mark in 1977. As well, he became the third running back to rush for 1,000 yards after just the ninth game of his career, joining Adrian Peterson and Eric Dickerson. On November 13, 2016, he had his best game statistically to date, when he accounted for 199 total yards and three of the Cowboy's touchdowns. During the victory over the Pittsburgh Steelers, Elliott had his first career receiving touchdown after catching a pass from fellow rookie Dak Prescott and taking it for an 85-yard touchdown and ran 32 yards for the game-winning touchdown with only 33 seconds left in the game. In Week 11, Elliott rushed for 97 yards against the Baltimore Ravens. On his second carry of the game, he ran two yards to pass Tony Dorsett's Cowboys rookie rushing record. ↑ Sayles, Damon (June 28, 2012). "Ezekiel Elliott is never satisfied". ESPN.com. ↑ Kvidahl, David (May 1, 2013). "Overall male athlete of the year: Ezekiel Elliott". StlToday.com. ↑ "Ohio State Buckeyes RB Ezekiel Elliott Bio". OhioStateBuckeyes.com. ↑ "Ohio State Buckeyes RB Ezekiel Elliott - Scout". Scout.com. ↑ Bennett, Brian (April 16, 2014). "Buckeyes' Elliott seeks to fill Hyde's shoes". ESPN.com. ↑ Archdeacon, Tom (September 30, 2014). "Ezekiel Elliott emerges as elite running back for Buckeyes". Ohio.com. ↑ "12 Named Academic All-Big Ten Conference". OhioStateBuckeyes.com. December 10, 2014. ↑ "College Football Gamecast - Oregon vs Ohio State". ESPN.com. January 12, 2015. ↑ Kadar, Dan (November 23, 2015). "Ezekiel Elliott leads exodus of Ohio State talent headed to the NFL". SBNation.com. ↑ Murphy, Dan (November 28, 2015). "Ohio State feeds Ezekiel Elliott in a blowout at the Big House". ESPN.com. ↑ Emmons, Matthew (December 1, 2015). "Ohio State star Ezekiel Elliott picks up pair of Big Ten season awards". FOXSports.com. ↑ "Ezekiel Elliot is best, most complete prospect since Adrian Peterson". ProFootballFocus.com. March 2016. ↑ "Scout: Ezekiel Elliott could be the next Adrian Peterson". NFL.com. April 26, 2016. ↑ Zierlein, Lance (April 26, 2016). "NFL.com Mock Drafts". NFL.com. ↑ Mayock, Mike (April 27, 2016). "NFL.com Mock Drafts". NFL.com. ↑ Casserly, Charley (April 28, 2016). "NFL.com Mock Drafts". NFL.com. ↑ "Ezekiel Elliott NFL Draft Prospect". NFL.com. Retrieved July 2, 2016. ↑ "NFL Events: Combine Player Profiles - Ezekiel Elliott". NFL.com. ↑ "Ohio State RB Ezekiel Elliott: 2016 NFL Draft Scout Player Profile". NFLDraftScout.com. ↑ "NFL draft: Results, analysis for every Round 1 pick". ESPN.com. April 29, 2016. ↑ "5 favorites to win NFL Offensive Rookie of the Year". FoxSports.com. May 4, 2016. ↑ "Top six NFL Offensive Rookie of the Year candidates for 2016". NFL.com. May 10, 2016. ↑ "Former NFL GM: I think Cowboys RB Ezekiel Elliott is going to be Offensive Rookie of the Year". DallasNews.com. May 11, 2016. ↑ "NFL's scariest position groups: Ranking the top 10 for 2016". NFL.com. May 31, 2016. ↑ "Cowboys sign Ezekiel Elliott to $24.9 million contract". ESPN.com. May 18, 2016. 1 2 "NFL Player Profile:Ezekial Elliott". NFL.com. Retrieved November 22, 2016. ↑ Shook, Nick (November 14, 2016). "Ezekiel Elliott breaks 1,000 yards, hearts of Steeler Nation". NFL.com. ↑ Ortega, Mark E. (November 3, 2016). "Tom Brady, David Johnson are Players of the Month". NFL.com.